Summary: Katherine Hill left her small New England hometown in pursuit of a dream. Now, twelve years later, she’s a high-powered cosmetics executive in Manhattan and a much glossier version of her former self, unrecognizable to her family and old friends. Not that she would know—she hasn’t been home in over a decade. Laney Marten always swore she’d never get “stuck” in Manchester, Vermont. No, she was destined to live out her glamorous big-city dreams. Instead, she wound up a young wife and mother. That was when her best friend ran out. When Katherine receives word of an inheritance from former neighbor Luella Hancock, she reluctantly returns home to the people and places she left behind. Hoping for a second chance, she’s met by an unforgiving Laney, her former best friend. And there’s someone else who’s moved on without her—someone she once loved. 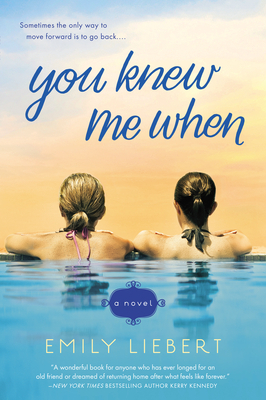 Maybe it's the water on the cover of the book, but I just knew I had to read YOU KNEW ME WHEN by Emily Liebert when I was vacationing in the Outer Banks. It probably didn't hurt that this book sounded like a fantastic beach read. I am totally a sucker for books about female friendships, and YOU KNEW ME WHEN sounded like it might explore an extremely complex relationship between two very interesting women. YOU KNEW ME WHEN tells the story of Katherine and Laney, two women who were as close as childhood friends could be -- almost like sisters. As teenagers, Katherine and Laney had their entire lives planned out; however, Laney's plan didn't pan out exactly as she had hoped when she found herself unmarried and pregnant. It was at this same time that Katherine left Laney to pursue her dreams in New York City, and Laney felt as if Katherine left her in her time of need. Their friendship dissolved and Katherine didn't even return home for over ten years. Then out of the blue, Katherine receives word that Louella, the woman who lived in the house between Katherine's and Laney's, passed away. In Louella's will, she bequeathed her estate to Katherine and Laney under the condition that they clear out her house and her belongings... together. As the two women reluctantly agree to carry out Louella's last wish, they are forced to examine their past behavior and eventually comes to terms with each other's decisions. When I first picked up YOU KNEW ME WHEN, I admit that I wasn't blown away by the story line. Don't get me wrong -- it sounded like something I'd enjoy, but I wasn't entirely convinced that the plot was all that original. And maybe it wasn't a totally new story; however, it was one that I thoroughly enjoyed and couldn't put down. For some reason, I immediately became caught up in these women's lives (and by that I mean, Katherine's, Laney's, and Louella's); and I loved this story of broken hearts and broken dreams. I think one of the reason I enjoyed this book so much was that Ms. Liebert created three dynamic women and then made them very real. I won't go so far as to say that I liked everyone from the get-go because I thought Katherine and Laney had some issues and had made some major mistakes. However, as the story progressed and I remembered how young they were, I found that my heart went out to both of them. As they both began warming up to each other and letting go of the grudge, I found myself rooting for their happiness. Another aspect of YOU KNEW ME WHEN that I enjoyed was how the story was told. The book was told in alternating chapters in both Katherine's and Laney's first person voices. In addition, the book went back and forth between the present and the past. I really think was an extremely effective way to tell these women's stories. I was also impressed with how well the author managed to capture individual voices for each character. As a reader, I appreciated getting to know the adult versions of Katherine and Laney as well as the childhood versions. It was interesting to see how much they changed... and how much they stayed the same. I do think YOU KNEW ME WHEN would make a terrific book club selection for female book clubs of all ages. Unfortunately, I wasn't able to find a reader's guide with discussion questions, but honestly, I don't think you really need one. Some of the themes you might want to explore include parent/child relationships, trust, betrayal, love, forgiveness, loss, grief, and redemption. One last thing.... I think it's so cool that Ms. Liebert has some very unique collaborations for YOU KNEW ME WHEN. I really hope this is a new trend for authors to publicize their books! One is with Zoya, a nail polish brand, that is releasing a limited edition collection of three colors for the Fall, each based on one of the characters in YOU KNEW ME WHEN. Can I just say that I love these shades? I will be sporting the Luella purple color on my toes for the fall, and I might even try that green! Another collaboration that Ms. Liebert has is with the designer Meskita, who has designed dresses based on the characters. I highly recommend YOU KNEW ME WHEN to fans of women's fiction and book clubs. How fun to have nail polish to match the characters! This sounds like a great vacation read, although maybe not quite the book for me. I'm not sure there are a lot of unique storylines when exploring women's friendships so it the characters that can really make a book stand out. It sounds like this book has fabulous characters. I can't wait to read it.